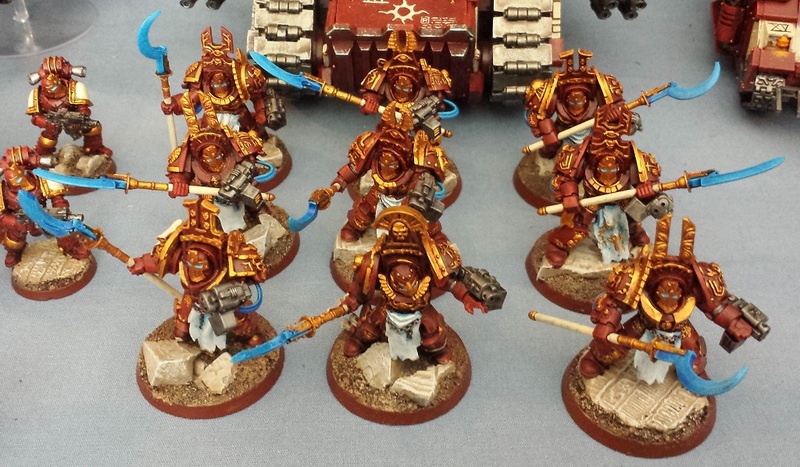 Mordian 7th Regiment: Heresy Era Thousand Sons - Complete! Following the Las Vegas Open, I took some time to lay out all the Thousand Sons and get one final family photo before they go up on the auction block to help fund the next project! Starting off we have the whole group laid out for the big picture! Was pretty fun to see 'em all laid out at the same time. I have a tendency to pack the units away in battlefoam trays as soon as they're done, so I rarely get a sense of what they all look like at once. Characters aplenty! From left to right, Siege Breaker Megiddo, Apothecary Thothmes, Malagor Auramagma, the Primarch Magnus the Red, Assault Captain Besenmut, Khalophis and Ankhu Anen. For when you absolutely, positively need to roll ALL the psychic dice you can get your hands on! Fulfilling the Troops slots are the obligatory 20-man tactical squad Hesyr. Poor sergeant Hesyr is suffering a bit of the flesh change! Assault squad Mekata is generally joined by Captain Besenmut, and their mobility has helped shore up weak spots in the Thousand Sons line on several occasions. Breacher siege squad Pasht never actually saw combat, but I did like how they turned out. Tactical support squad Jafari and their plasma guns. Invariably they were more of a danger to themselves than others! In the Fast Attack slots, Javelin Speeder Squadron Qaa always performed admirably, harrying the flanks of their opponents and putting lascannon fire on the exposed sides and rear of many an enemy tank. Seeker squad Tolbek and their combi plasmas made for a surprisingly effective hunter/killer team, and killed a number of the enemy leadership. Heavy support squad Khalid's missile launchers suffered somewhat in the shift to 7th edition, but it's hard to argue with 10 krak missiles (or frag when they went up against horde armies)! Whirlwind Scorpius Haathor's Breath has an excellent kill tally of enemy marines, while the Predator Executioner Detachment Ju Amun consistently punched well over their weight class. I will absolutely be including a pair of plasmacutioners in the next legion force, of that there is no doubt! 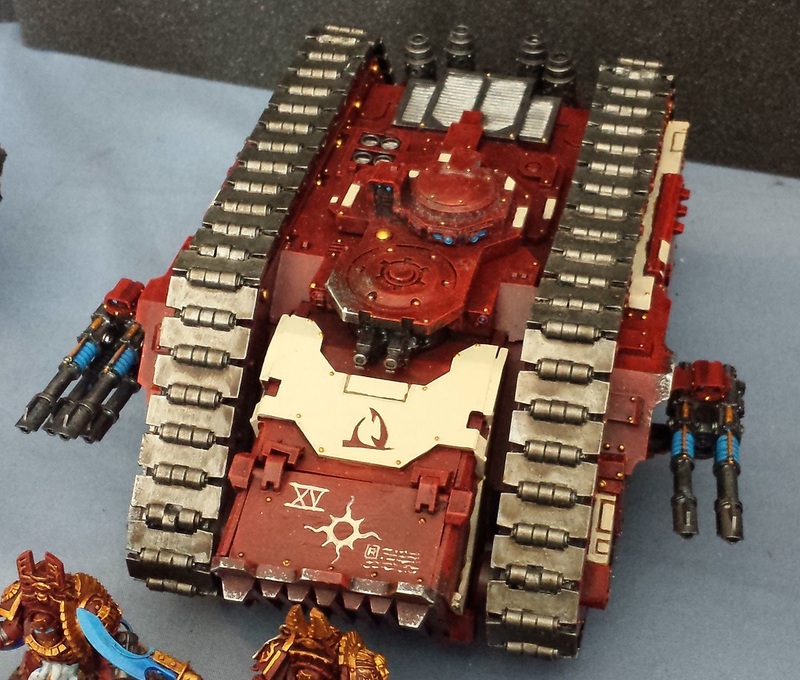 ...And finally the big bruiser of the army, the Spartan Assault Tank. Can't go wrong with one of these beasts! I had an absolute blast building and painting this army, but the Heresy bug hasn't left me yet! While I still have a significant Mechanicum army in the wings, the thought of painting more red doesn't much appeal at the moment so I'm thinking it may be time to revisit the Alpha Legion idea I was kicking around a while back. Been re-listening to Legion again of late, and scribbling down ideas and combing the web for appropriate bits and kits to work up some Geno Five-Two to go along with 'em! Ever onward to the next project! Great work, the army looks absolutely stunning! I would like to point out...that though this army looks stunning in photos, it looks EVEN BETTER in person. Really great work, and I am very jealous at your not only your painting speed, but painting skill! And already you got a bid on it! Wow! @Chris John: Thanks very much! @Valhallan 23rd: I really appreciate it! @Greg Hess: Thank you very much, man! Next time we end up attending the same event, we need to schedule a pick up game in advance! Had no idea the LVO was going to be the madhouse it was! @Dai: Hooray! That means I can get serious about the next FW and Victoria Lamb orders. I've more or less settled on doing up the Alpha Legion and Geno Five-Two based on the forces in the book Legion - quite looking forward to it, if only because it won't be red and gold. Hah!